Earlier this fall Mr. Eunice Laster, of the head of Wallen’s Creek, told me that there was an existing way station from the Fincastle to Cumberland Gap Turnpike yet in existence in Stickleyville. Yesterday I followed his directions, which was to go past the Stickleyville fire station and that it would be there. I turned west onto the Middle Fork of Wallen’s Creek Rd. in the south side of Stickleyville on State 612, and immediately turned left onto the old loop of US 58 & 421 that used to be the main street of town. The fire station was 50 yards on the left. Passing that I crossed Wallen’s Creek, and followed the now dead end of the loop as it approximated the current US 58 & 421. On the left at the end of the now cut off loop of old road stood an old wood house with a strikingly familiar, yet odd, upper front porch. After thinking a moment, I realized that it was the same unique design as that of the known Fincastle Turnpike Way Station that used to stand just to the south of Rose Hill. I had a photograph of it in Bear Grass. Comparing the two, they seem to have been made from the same design. The tightness of the overhand over the upper front porches, and the bannister designs are the same. There was no trouble believing that Mr. Laster was right. However, a photograph of the Allen Station house from 1904 shows that that front porch was added after 1904, the date to that picture. It would seem likely that the Rose Hill way station also had its front porch added in the same time frame as Col. Allen’s. Review of the CD (second image) of the 1833 official map of the postal route version predating the 1844 Fincastle to Cumberland Gap Turnpike that I have from the Library of Virginia showed that this way station was mile post 50, starting where the road entered Virginia from Tennessee near Cumberland Gap. It was labeled as belonging to “Col. Allen”. James Allen came up the Powell Valley from Claibourne Co., Tennessee, and married Hannah Hanger. They bought land on Wallen’s Creek from John and Susannah Eller (recall Eller’s Gap where US 58 traverses Powell Mountain). James Allen represented Lee Co. in the House of Delegates in 1824, and served two terms. In 1833 (the date of the map) he obtained a license to keep “a house of private entertainment”. This would indicate that his way station was also an inn, as was common among the better way stations. 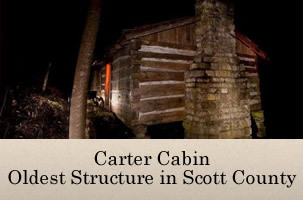 The lesser ones, such as the Carter House of Rye Cove, and now reassembled in Natural Tunnel State Park, were used only as places where the horses were changed on the stage coaches. James Allen was High Sheriff in Lee Co. in 1834, and died in 1840. The evidence therefore shows that this way station was also an inn, and was built in 1833 as part of the improvement in the Postal Road that followed the old Wilderness Road. It, therefore, predated the Fincastle to Cumberland Gap Turnpike by 11 years. It’s owner is documented. The way station passed to his son, John Hanger Allen 1839, apparently in anticipation of Col. James Allen’s death. Therefore, it likely served the Turnpike after the Col.’s passing.